Below is David Gordon’s introductory essay to Professor Hoppe’s recently published monograph From Aristocracy to Monarchy to Democracy. it is not my purpose here to engage in standard history, i.e., history as it is written by historians, but to offer a logical or sociological reconstruction of history, informed by actual historical events, but motivated more fundamentally by theoretical — philosophical and economic — concerns. The work of Carl Menger and Ludwig von Mises on the commodity origin of money is a prime example of what Hoppe has in mind. In carrying out his illuminating project, Hoppe finds himself in opposition to the dominant way of looking at the evolution of government. According to this perspective, government has over the centuries become ever more democratic. Rule by the people is the final form of government; once it has been reached, history, at least as far as government is concerned, has ended. This historical movement, further, is a “good thing.” It is the triumph of freedom. History is the story of progress. Hoppe is not a complete pessimist like the “Gloomy Dean” W.R. Inge, who, in his famous Romanes Lecture of 1920, denounced “the superstition of progress.” To the contrary, Hoppe thinks that in economic life, the Industrial Revolution enabled mankind to achieve an unprecedented level of prosperity. In government, though, matters are entirely different, and here Hoppe is a firm opponent of progressive orthodoxy. For him, rather, history in this area is a tale of a fall — not from the Garden of Eden but rather from a reasonable way of settling disputes. How would real, rational, peace-seeking people have solved the problem of social conflict? … What people would most likely accept as a solution, then, is this: Everyone is, first off or prima facie, presumed to be owner — endowed with the right of exclusive control — of all those goods he already, in fact, and so far undisputed, controls and possesses. This is the starting point. As their possessor, he has, prima facie, a better claim to the things in question than anyone else who does not possess these goods — and consequently, if someone else interferes with the possessor’s control of such goods, then this person is prima facie in the wrong and the burden of proof, that is to show otherwise, is on him. However, as the last qualification already shows, present possession is not sufficient to be in the right. The criteria, the principles, employed in deciding between a present controller and possessor of something and the claims of another person are clear then, and it can be safely assumed that universal agreement among real people will be reached regarding them. To reiterate, Hoppe sees property as antecedent to the state; people in a “state of nature” will rationally agree on the appropriate principles. In order to settle their conflicts and to have the settlement lastingly recognized and respected by others, they will turn to natural authorities, to members of the natural aristocracy, to nobles and kings. What I mean … is simply this: In every society of some minimal degree of complexity, a few individuals acquire the status of a natural elite. Due to superior achievements of wealth, wisdom, bravery, or a combination thereof, some individuals come to possess more authority than others and their opinion and judgment commands widespread respect. I agree with you that there is a natural aristocracy among men. The grounds of this are virtue and talents. … The natural aristocracy I consider as the most precious gift of nature, for the instruction, the trusts, and government of society. And indeed, it would have been inconsistent in creation to have formed man for the social state, and not to have provided virtue and wisdom enough to manage the concerns of the society. Is the process Hoppe has set forward more than just speculation? Hoppe looks to feudal Europe for confirmation of his line of thought. I only claim that this [feudal] order approached a natural order through (a) the supremacy of and the subordination of everyone under one law, (b) the absence of any law-making power, and (c) the lack of any legal monopoly of judgeship and conflict arbitration. And I would claim that this system could have been perfected and retained virtually unchanged through the inclusion of serfs into the system. Unfortunately, matters did not develop in this happy way. Instead, kings seized more and more power. They claimed to have final authority, rejecting appeals to competing authority within the territories they controlled. Hoppe finds it easy to understand why kings might endeavor to arrogate such power to themselves, but another question is at first puzzling. How were the kings able to succeed in their grasp for absolute power? Why did not the partisans of the old aristocratic order thwart them? Hoppe offers a two-part answer to this mystery. First, the king allied with the people against the aristocracy. He appealed to the always and everywhere popular sentiment of envy among the “underprivileged” against their own “betters” and “superiors,” their lords. He offered to free them of their contractual obligations vis-à-vis their lords, to make them owners rather than tenants of their holdings, for instance, or to “forgive” their debts to their creditors, and could so corrupt the public sense of justice sufficiently to render the aristocratic resistance against his coup futile. In this grasp for power, the king had the aid of the “court intellectuals.” They propagandized on behalf of the king, supporting the thesis that the king represented the people. The demand for intellectual services is typically low, and intellectuals, almost congenitally, suffer from a greatly inflated self-image and hence are always prone to and become easily avid promoters of envy. The king offered them a secure position as court intellectuals and they returned the favor and produced the necessary ideological support for the king’s position as absolute ruler. How did the court intellectuals carry out their malign mission? They did so by promoting a twofold myth. Society began in a war of all against all. To escape this condition, people voluntarily contracted with an absolute ruler. In that way, they could escape chaotic disorder. Hoppe firmly rejects both parts of this story, as should by now be abundantly evident. Society begins, not in a Hobbesian state of nature, but rather with people’s mutual recognition of rights; and there was no contract giving power to the king. With help of the court intellectuals, monarchs in Europe gained the absolute power they sought; but the appeal to the people eventually proved their undoing. The myth of the contract helped to transform the absolute monarchy into a constitutional one; and this transition Hoppe by no means regards as progress. Constitutions “formalized and codified” the king’s right to legislate and to tax. Constitutional monarchy eventually ceased to satisfy the intellectuals. Ironically, the very forces that elevated the feudal king first to the position of absolute and then of constitutional king: the appeal to egalitarian sentiments and the envy of the common man against his betters … also helped bring about the king’s own downfall and paved the way to another, even greater folly; the transition from monarchy to democracy. When the king’s promises of better and cheaper justice turned out to be empty and the intellectuals were still dissatisfied with their social rank and position, as was to be predicted, the intellectuals turned the same egalitarian sentiments that the king had previously courted in his battle against his aristocratic competitors against the monarchical ruler himself. With the help of the intellectuals, rule by the people came to replace monarchy; and, Hoppe famously argues, this transition is by no means to be celebrated. To the contrary. Rather than being restricted to princes and nobles, under democracy, privileges come into the reach of everyone: everyone can participate in theft and live off stolen loot if only he becomes a public official. Democracy then does not end the depredations of absolute monarchy but in fact increases them. Yet a king, because he “owns” the monopoly and may sell and bequeath his realm to a successor of his choosing, his heir, will care about the repercussions of his actions on capital values. Here it is necessary to avert a misunderstanding. Hoppe is not a defender of absolute monarchy — far from it. He argues only that democracy as it is today understood is worse than monarchy. But, as is never to be forgotten, monarchy ranks far below the best system, one of private property rights in which respected members of the elite settle disputes. This essay, thus, is a veritable tour de force. It accepts the standard account of the evolution of government from feudal aristocracy to monarchy to democracy but precisely reverses the standard valorization of this process. If Hoppe is no exponent of progress here, though, he does not leave us with a counsel of despair. The democratic State’s frenzied finance cannot continue indefinitely; and he finds grounds for hope in a movement toward smaller, decentralized governments. Economic crisis hits, and an impending meltdown will stimulate decentralizing tendencies, separatist and secessionist movements, and lead to the breakup of empire. In this way the growth toward Leviathan may be reversed. This essay provides an ideal introduction to Hans Hoppe’s extended account of his political thought in his great work Democracy: The God That Failed. 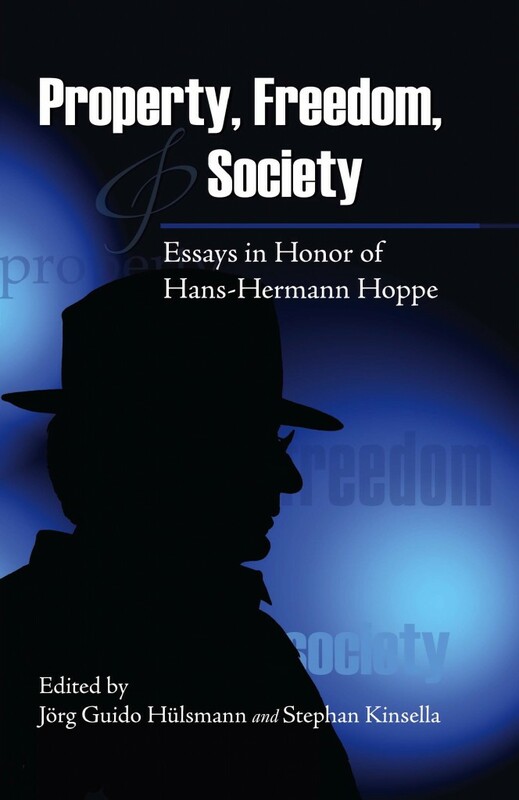 Hoppe is one of the most original and important social theorists of our time, and readers will gain a clear understanding of the essence of his ideas about the growth of government.